Pat Flanagan has been appointed interim Westmeath manager following Brendan Hackett’s resignation last weekend. The Clara native will take charge until the end of this year when the position of manager will then be reviewed. The county board were quick to act to fill the void given that we are only weeks away from our opening championship game. At a county board meeting on Wednesday night Pat Flanagan was proposed and seconded. He was nominated by the football board with the backing of the players. Maryland delegate Richie Browne also proposed Dessie Dolan Snr. A vote was taken to ratify the football board’s decision to propose Flanagan’s appointment and this received the clear backing from the floor. A second vote then had to be taken to formally ratify Flanagan as the interim manager and this too received a clearcut majority. It was also agreed that all interested candidates, including Dessie Dolan senior if he puts his name forward, would be granted an interview, when the post comes up for review at the end of the year. They say a week is a long time in politics. It can also be the case in the life of an inter-county manager. Brendan Hackett never expected his reign to end so prematurely. In fairness to him he did the honourable thing in stepping aside once it was clear the players had lost confidence. In doing so he prevented a long drawn out Limerick-like saga from which there are no winners. Hopefully all concerned can move on to better things. Flanagan will be a popular appointment. He has a proven track record in Westmeath having led Tyrrellspass to a number of county titles, including a run to the provincial decider. He will have good knowledge of the talent at his disposal in the county and won’t be long in drawing up a new panel. Hopefully this will include a number of our more experienced players who had decided to step aside. Rumour has it that Denis Glennon will make himself available for selection again. While the club scene will take centre stage in the coming week, Flanagan will be keen to get to work in preparation for our Leinster Championship opener against either Carlow or Wicklow. There is no news as of yet as to who Flanagan’s selectors will be. They say it is better to nearly drown than to nearly be saved. Westmeath hurlers came very close to drowning in division two of the National Hurling League but a late Derek McNicholas goal provided a valuable lifeline. Eight points down at the break and with the unappetising prospect of division three hurling next year looking ever more likely, Kevin Martin’s men used all of their fighting qualities to grasp an unlikely two point win. McNicholas’ goal followed good approach play from Joe Clarke to seal matters and in doing so keep Westmeath in division two. Having put in some very lacklustre performances in this year’s campaign, most notably against Carlow and Kildare, the attitude and performances have improved in recent weeks. A win over Antrim and a good showing against Clare indicated things were improving within the camp, and last Sunday’s win put the icing on the cake. This win will also raise confidence levels ahead of The Christy Ring campaign. If they can manage to repeat this sort of performance they are sure to make a bold bid for a third Christy Ring title. Westmeath minor footballers had little difficulty in seeing off the challenge of a disappointing Carlow outfit in Dr Cullen Park last Saturday. 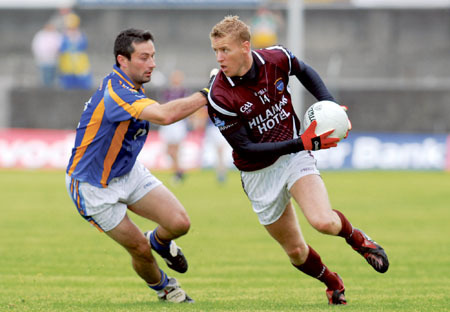 John Heslin, not for the first time in recent weeks, had a massive influence on proceeding in a maroon and white jersey. The St Loman’s clubman sealed this game with a stunning goal with time running out. While Ger Heavin will be delighted that his team have got off to a winning start he will also be well aware that there is plenty of room for improvement. They must now await results from the losers’ section to see who their next opponents will be. What a boost to football in the county if our minors could do like our U21s and reach a provincial decider. It’s hard to believe that it’s that time of year again. This year’s Westmeath senior football championship gets underway this weekend with the meeting of Maryland and Coralstown/Kinnegad. All other games will be taking place next weekend. Finbar Egan’s Maryland reached the quarter finals last year and will be keen to get off to a winning start. Kinnegad lost out to St Loman’s in last year’s semi-final. Kinnegad easily accounted for Maryland in the league but championship as they say is championship. David Kilmartin is away travelling and he is a big loss to Colm Coyle’s men. In a difficult game to call I’m going to side with Maryland to get off to a winning start. In almost a carbon copy of their provincial final performance against Westmeath, Dublin ended Roscommon’s hopes of reaching this year’s Cadbury’s U21 decider. In both games Dublin built an early lead, then were totally outplayed for long stretches, before finishing strongly in the end. Dublin had 2-2 on the board in the opening five minutes, the second of which came from a spot kick. Roscommon however soon began to find their stride and were winning more than their fair share of possession. But for some wayward shooting the half-time deficit of 2-3 to 0-4 might have been less. Roscommon continued to claw their way back into contention and were just three points adrift when Dublin’s Ted Furman received his marching orders midway through the second half. At this stage the odds looked very good for Jimmy Gacquin’s men. Dublin had other ideas however and it was them who now upped the ante and hit five unanswered points to seal their place in the final against Donegal. While Dublin have managed to win their last two games comfortably in the end, despite being outplayed for long stretches of the game, I think Donegal look good value at 11/8 to lift the U21 title. This Roscommon team can hold their heads up high. But for the nightmare start and some very poor shooting in front of the posts the outcome would surely have been different. There is however hope for the future. Athlone U14s emerged on top in a ding-dong battle with Kinnegad in the final of this year’s Feile. Both teams and their mentors deserve enormous credit for the quality, spirit, and intensity at which the game was played. Either side could have won it, but in the end the quality of players like Mathew Darling, Chris Reid, Jack Quinn, Fionn Dowd, Aidan Byrne, and Charlie McMickan swung the tie in Athlone’s favour. They will now represent Westmeath in this year’s Feile in Derry in July.